EDIT: For those who’d like to know, this block can be found here, courtesy of Beth from Piece By Number. She has a heap of free blocks, take a look. I’ve been taking some machine-piecing lessons lately and I’m starting to make friends with my machine. Yesterday we did foundation paper piecing. I can’t tell you how many times I had to undo it and redo it and then cut the wrong piece etc.,etc. I managed to finish two quadrants of the block at the lesson. Today I finished the other two at home and wonder of wonders, I didn’t make a single mistake. The thing that made it easy for me was trimming the excess to the next to be sewn seam line so I could easily line up the next piece. I used a tailor’s awl to score the paper so that I could fold it back before sewing to trim and suddenly everything just flowed. 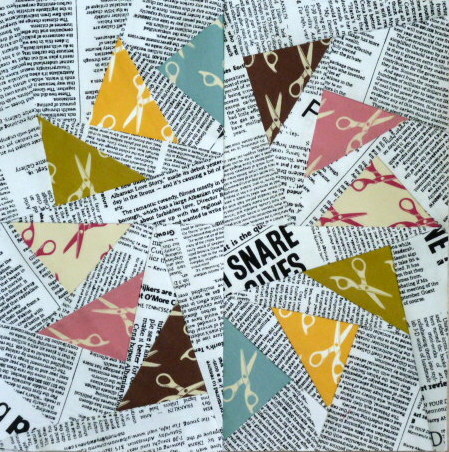 So here’s my foundation pieced “newspaper cuttings” block. I really like that block. Where would I find it to make? Looks great – such a clever use of fabric! I’m glad you’re making friends with your machine. Handwork is wonderful, but you’ll never get through your stash that way! Love the choice of fabrics – paper and scissors. You might need a rock border! HEEHEE (couldn’t resist).